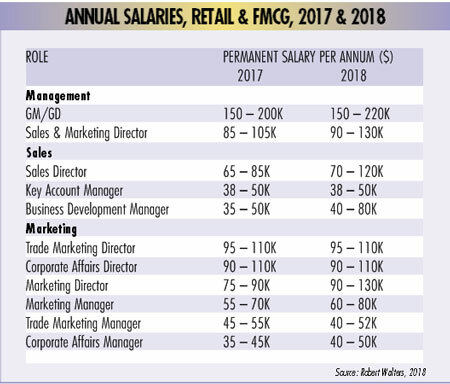 FMCG companies are locked in a fierce battle to recruit and retain talent in an increasingly competitive environment. The Universal Robina Corporation (URC) from the Philippines recently announced it would undertake innovation and continuous enhancement of its business operations and internal capabilities after reporting unexpectedly poor performance in Vietnam in 2016 and 2017. Apart from disclosing a plan to offer new products in the local market this year and to boost exports, the company also appointed a new President and General Director of URC Vietnam, Mr. Laurent Levan. The change in leadership at the food and beverage (F&B) giant expresses its ambition and eagerness to reboot operations and further strengthen its foothold in the country. A recent report from Navigos Search on executive recruitment demand in Vietnam in the first quarter of the year found that many large Vietnamese fast-moving consumer goods (FMCG) companies make great efforts to attract potential candidates through dynamic recruitment activities. These local companies are looking to restructure and transform their business and reposition their brand and are willing to pay more to acquire quality candidates, which has led to salaries being nearly the equal of those found at foreign enterprises. The salary gap between large Vietnamese and foreign enterprises is becoming smaller, especially in senior management positions, the report noted. This can be also explained by a stagnancy in value growth at multinational companies (MNCs) in Vietnam in 2017, which increased just 2 per cent against 5 per cent in 2014, while local players recorded 7 per cent value growth compared to 5 per cent two years ago and contributed 42 per cent to total FMCG sales, according to Nielsen Vietnam. Its Quarterly Market Pulse Report for the fourth quarter of last year showed that nationwide FMCG sales growth slowed significantly, to just 0.5 per cent versus 6.4 per cent in the third quarter. Mr. Levan told VET that the company believes it can source good talent locally. “URC Vietnam provides a working environment where we enable our staff to work at their best,” he said. “They also have many opportunities to develop their career paths within our international network.” URC Vietnam now has more than half its 40 or so senior management positions held by Vietnamese. The company also has various programs focused on developing local talent and enabling them to expand their skills and capabilities. Such programs include sending local talent to URC’s operations in other markets. “It is important for us that our talent see the various opportunities for career advancement not only at URC Vietnam but within the Group and beyond, so we are determined to develop their capabilities so they can reach their full potential,” Mr. Levan said. He also revealed that it often takes the company about two months to recruit a suitable candidate for senior positions and can take even longer depending on the specific position and the availability in the jobs market. According to Ms. Truong Bich Dao, HR Director at Nestlé Vietnam, her company spends even more time, around three to five months on average, to successfully recruit senior staff. Problems also exist in finding capable marketing staff. In Vietnam since 1995, Japanese noodle maker Acecook now employs some 5,500 people in its offices and facilities, of which 30 per cent of managers and 60 per cent of senior staff are local people. Ms. Tran Thi My Van, Chief of Staff at the General Director Department at Acecook Vietnam, said the company could actively develop its high-level staff from internal sources, nurturing them from junior positions, but this certainly takes a long time. Most FMCG manufacturers in Vietnam regularly face difficulties in recruiting certain positions, especially technical staff in research and development (R&D), according to Ms. Phuong from Talentnet. This very much relates to job function, not sector. “At Acecook Vietnam, the three positions that are most problematic in filling are marketing, strategy administration, and R&D,” Ms. Van said. She also revealed that the main challenge for Acecook Vietnam is that managerial staff may possess expertise but have limitations in foreign languages, administration, management skills, and soft skills. The company’s solution is to continue its training, both internally and by engaging professional external trainers. Similarly, Mr. Levan said that Vietnam’s younger generation has good potential thanks to their education and proactiveness but still need to be trained in soft skills and leadership, as senior positions require experience in managing and resolving unexpected challenges or issues. The latest Robert Walters’ report noted there will be a particular demand in the FMCG sector for business development managers, consumer marketing managers, and marketing directors with diverse industry backgrounds and commercial mindsets. However, “we foresee that hiring managers will have difficulties in sourcing professionals for such roles, mainly because of a lack of candidates who are proficient in English,” the report noted. To address these challenges, Robert Walters recommended that hiring managers offer candidates a productive, open, and supportive working environment and clearly communicate pathways for career progression and offer competitive salary packages.